Start by checking every component in the audio chain. Is the problem eliminated by swapping cables, headphones, or the audio source? DACs: Try a different USB port, a different USB cable, and a USB hub or different computer. Amplifiers: Try another audio player, a different input cable, and another pair of headphones. For battery powered amplifiers, try connecting a power adapter or swapping batteries. Amp+DACs: Try the amplifier by itself (use 3.5mm/RCA input instead of USB input). If the amplifier operates normally, see DAC troubleshooting. Otherwise, refer to Amplifier troubleshooting. Please also refer to your device's specific Instructions Guide. Many behaviors are easily explained by normal device operation. 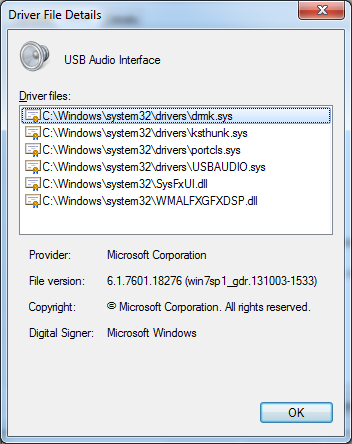 Causes: Damaged or unsuitable USB cable or USB port, or missing drivers. Solution: Try a 3-foot or shorter USB cable. Long and/or custom USB cables can impact device connectivity at some USB ports. Avoid boutique 'audiophile' cables. The official Universal Serial Bus specification dictates a 90-ohm characteristic impedance; boutique cables may or may not conform to mandatory data specifications. A different USB port or powered USB hub can sometimes help. Causes: Digital audio requires uninterrupted, real time data. Quiet crackling or popping sounds during playback are symptomatic of buffer underrun, meaning the USB or S/PDIF audio source failed to deliver a continuous stream of digital data to the DAC. Or more simply, the device driver's real time process was interrupted. Buffer underrun on a USB host is a low level software behavior that may occur regardless of the load and available computational resources of your computer. Higher sampling rates are more likely to result in buffer underrun conditions because more data must be transmitted. Some known causes include: Intel Haswell CPUs, Apple's Fusion Drive, WASAPI Playback on Windows, and USB ports serving multiple devices. Faulty USB or optical cables can also create buffer underrun, since data will not be reliably delivered. Solutions: Set your DAC to a lower sampling rate, such as 24/44.1k or 24/96k. Try a different cable. For USB DACs, try a USB port on a different USB bus of the PC, such as a port on the opposite side of your laptop or tower. Try an external USB hub. Also see Cantabile's Glitch Free PDF. If your DAC and PC support coaxial or optical S/PDIF input, switch to a mode other than USB. Some installations may not present the "Supported Formats" tab. As a workaround, you may also first select another audio device, and then switch to your DAC to prevent the app from defaulting to an unavailable format. Causes: A known operating system bug can cause some DirectSound (Direct3D) applications, usually games, to freeze for up to 60 seconds while attempting to load an absent hardware device. Causes: PS4 contains a USB audio bug which sets very low volume despite showing maximum volume on screen. Solution: Use optical output if possible. If you require USB audio, please contact us and we can load alternative firmware to disable operating system level volume adjustment. This modification disables PS4's ability to reduce volume. Causes: In Ubuntu, the Pulsesound interface may not reflect the sound configuration defined by `alsamixer`. In other words, 100% volume in the GUI is innaccurate and/or equalization has been incorrectly applied to the digital audio stream. Causes: Many DACs enter self-mute mode when audio stops. Quickly changing tracks in some software causes a DAC to rapidly mute and un-mute, resulting in discontinuty at the analog output. Mathematical discontinuity is a common and normal behavior, and is handled differently by each system and app. Also note that using ASIO output may exacerbate this effect! See foo_out_asio release notes. Causes: Unsuitable USB cable, or undesirable USB power management settings. Newer operating systems (Win 7, 8, 10, and OS X 10.9+) sometimes utilize unnecessary power management configurations, which can limit power availability to a DAC. Solution: Try a 3-foot or shorter USB cable (also refer to 'USB device is not recognized by PC'). Try a powered USB hub. A hub guarantees power availability to connected equipment. Alternatively, try disabling power management options. 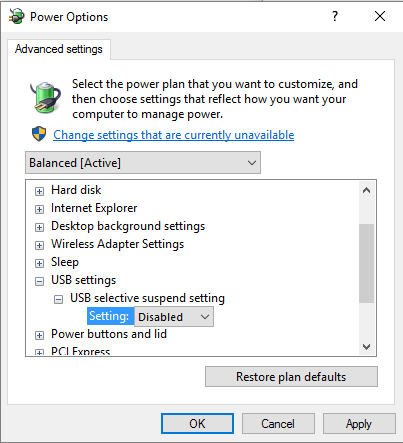 In Windows, Open Control Panel --> Hardware and Sound --> Power Options --> Change Plan Settings --> Change Advanced Plan Settings --> USB Settings --> Set 'USB selective suspend setting' to Disabled. While this configuration may help, a USB hub is a more reliable solution. Causes: Monitors and external speakers are often powered by switching power supplies, like your computer. While OL DAC and EL DAC are isolated from mains using an AC transformer, ground loop occurs between the PC ground and speaker ground. The audible noise may change as your PC load changes. Solution: If possible, switch to optical input. If your PC lacks optical output, it's best to install an affordable PCI-Express card with optical output. Alternatively, you can try a set of ground loop isolators. Causes: Please refer to our blog article, How to Connect Android, iPad, or iPhone to a DAC. Ensure that your specific Android device and OS version supports USB DACs. Try an in-line USB hub. Try rebooting the Android device while the DAC is connected. Try the demo version of USB Audio Player Pro. Please note that support is dependent on the mobile operating system, and can vary with each operating system version! 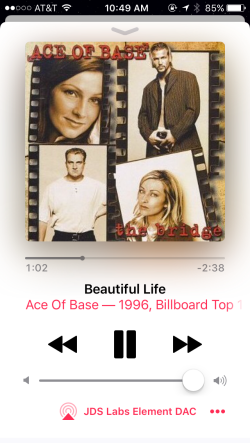 Google officially implemented USB Audio Class 1 (UAC1) support effective Android v5.0. Some customers have reported that previously DAC compatible Android v4.x devices no longer support their DACs after upgrading to Android v5.x. Others report that previously non-working Android 4.x phones and tablets finally gained support with Android v5.x. In other words, support remains unpredictable. The following user maintained list may help you: UAC1 - Android Compatibility. Connectivity success is most reliable in Android 6 and newer. If you still encounter difficulty, try connecting your DAC to an in-line or powered USB hub, then connect the hub to your Android's USB Adapter. Some Androids disable the 5V supply pin during OTG connections, which can prevent a successful connection. A hub eliminates 5V uncertainty. 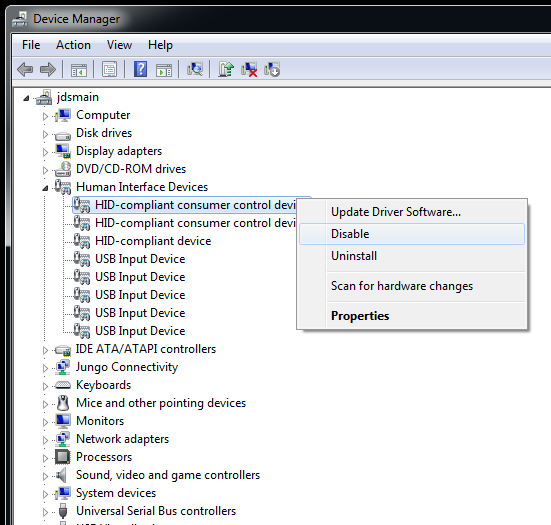 A list of tested USB Adapters is maintained in the JDS Labs FAQ. Try rebooting the phone or tablet while the DAC is connected, especially after iOS updates. JDS Labs has confirmed DAC support for iOS versions 7.x through 11.x (most recent build as of January 2017). Customers have reported DAC connectivity success with iOS 7.x, 8.x, 9.x, 10.x, and 11.x. Please note that support is dependent on the mobile operating system and can vary with each operating system update! The older Lightning to USB Adapter, part #MD821AM, may be used with iOS 7.x thru 10.x, but does not support USB Audio when used with iOS 11. Support frequently changes for Lightning to USB adapters. Newer units may require a newer version of iOS to be recognized. When a newly obtained Lightning adapter is connected to an older version of iOS, you may receive the warning, "This accessory is not supported by this device." Try updating to the latest version of iOS. Some versions of iOS may initially display a warning such as, "ODAC RevB is not supported". Accept the warning and simply reconnect the USB cable. Your DAC should then successfully connect without warning. If your DAC is unable to connect to your iPhone or iPad, try another iOS device for comparison. A dirty Lightning jack can prevent a DAC from connecting, even when the phone is able to charge or sync. Try cleaning troublesome Lightning jacks with a can of compressed air. Causes: A partial or total loss of audio usually indicates a damaged cable or audio jack. Solution: Try another input cable and another set of headphones. If using a 4-pin TRRS headphone cable (any cable equipped with a microphone or additional functionality), make sure to use an appropriate TRRS-to-TRS splitter. TRRS cables are incompatible with ordinary audio jacks. Many customers mistakenly try to resolve channel loss by partially removing the audio connector from the amplifier's jack. This is not a solution! A partially unplugged cable shorts the Left and Right cables, resulting in mono output. Feel free to contact us if other cables do not help, and we'll be glad to inspect further. Causes: Amplifier gain or volume is set too high for your equipment. Solution: Set amplifier to low gain position, or reduce listening volume. Please refer to Power is Volume for a technical explanation. Objective2 and Objective2+ODAC use a high-performance topology requiring that gain be configured to match the strength of your DAC or audio source. Please see the O2 FAQ for more information. Causes: Constant buzzing may indicate a damaged input cable, damaged audio jack, or ground loop interference. Solution: Try another input cable. If buzzing persists with other cables, but vanishes when disconnecting the cable from the audio player, you're experiencing ground loop. Try connecting the amplifier and audio source to different electrical outlets, or if possible, operate the amplifier from battery power (unplug power adapter). As a last resort, try a ground loop isolator. Causes: Very high efficiency headphones/IEMs, noisy audio source, or incorrect volume and gain settings. Solution: Try another audio player. If noise persists, you may have very high sensitivity (efficiency) headphones. For optimal performance with all headphones, set amplifier to the lowest gain position, set the audio player's volume at or near the maximum level (i.e., 100% volume at PC), and only adjust volume using the amplifier's volume knob. Switch the amplifier to high gain mode only when maximum listening volume is insufficient. Causes: Random buzzing or bursts of noise usually indicate wireless interference from cordless phones, cell phones, wireless routers, etc. The audio source itself may be generating background noise. Solution: Try a different input cable. Position amplifier as far away as possible from wireless devices. Cell phone and wireless routers should be positioned at least 4ft away from audio amplifiers. Some 1.9GHz (DECT) cordless phones have been known to cause significant audible interference with amplifiers and other devices, even from base stations positioned several rooms away. If neither help, try a different audio source. Causes: Analog potentiometers use a mechanical wiper travelling along a resistive path to adjust signal voltage (listening volume). Moving your amplifier's volume knob causes the wiper to move along its path. This mechanical process produces low level noise while the knob turns, and is most noticeable while music is playing. The noise may or may not be audible depending on your system. Solution: Please understand that wiper noise is a normal behavior of analog volume controls and varies based on many conditions. Certain climates can exacerbate the effect. You are more likely to notice wiper noise when adjusting volume while listening to quietly recorded music, or to music with low energy content. Wiper noise may become more noticeable as your potentiometer ages. The average potentiometer has a mechanical lifespan of 15,000 turn cycles, or about four years assuming 10 complete turns per day. If your potentiometer has reached the end of its consumable lifespan, we'll be glad to swap the part for you at cost. Causes: This is a minor side effect of a high performance analog volume control. Any amplifier which relies on an analog potentiometer to control volume will exhibit some degree of channel imbalance at the lowest threshold of knob rotation. Audible channel umbalance usually resolves by 15-25% rotation of the knob. So why do amplifier designers still rely on analog potentiometers? Performance! Tiny digital potentiometers can control volume with great resolution and balance at all volumes. However, digital pots introduce unwanted capacitance, which directly degrade total harmonic distortion (THD). High-end digital potentiometers with sufficiently low THD+N do exist, but their implementation in a headphone amp raises cost and greatly increases physical size. As long as gain is set appropriately, analog potentiometers provide audibly excellent channel balance and THD+N. Solution: Use the lowest gain setting of your amplifier. For particularly sensitive headphones, you may also need to reduce volume at your audio source.